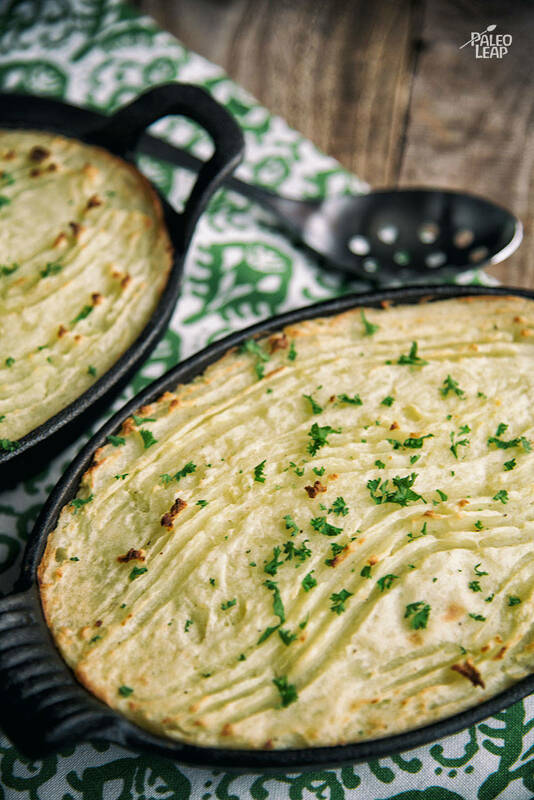 When you ask someone to list the best comfort foods of their childhood, those Sunday night dinners that still make their mouth water, shepherd’s pie will almost always make an appearance. It’s a savory, homey meal that is fairly budget-friendly, simple to prepare, and fills up even picky eaters. It’s no wonder our parents loved to serve it to us! One of the mainstays of shepherd’s pie is the mashed potato topping. Remember – white potatoes are completely fine for Paleo eaters. However, if you really prefer to keep these out of our diet, you can choose to use sweet potatoes instead. Just know this will change the flavor palette of the dish quite a bit – instead of a savory dish, it’ll be a lighter, savory-sweet taste. The ingredients list for this dish might seem a little overwhelming at first, but this casserole is a complete meal – you don’t need to add sides to this for a full plate. We love how much of a timesaver this can be – instead of prepping another dish, you can relax and anticipate how awesome your dinner will be while the casserole bakes. One of our favorite techniques for hectic weeknights is prepping in the morning and baking in the evening – get everything cooked and in your baking dish early in the day, refrigerate, and pop it in the oven when you get home. This can actually help the flavors in this dish because it gives them some time to mingle together before baking. If you really want to add something else to your plate, try prepping a simple salad while your shepherd’s pie bakes – the lightness of a salad can definitely help balance the heavier main course. Add the potatoes to a large pot and fill with water. Bring to a boil and allow to cook until the potatoes are soft (about 20 minutes). Drain the potatoes and put them back in the pot. Add the ghee, season to taste with salt and pepper, and mash until smooth. In a large skillet, melt cooking fat over medium-high heat. Brown the ground beef until no longer pink, then add the onions, carrots, celery and garlic. Add the tomato paste, dry red wine, beef stock, thyme sprigs, and bay leaves; season with salt and pepper to taste. Cook over medium heat until everything is cooked and vegetables are soft (10 to 12 minutes). Remove the thyme and bay leaves from the skillet. Place the ground beef-vegetable mixture at the bottom of a baking pan and top with mashed potatoes. Sprinkle with fresh parsley and bake in the oven for 25 minutes.